If you want to write to Chelsea Manning (official letters will still need the envelope to be addressed to Bradley Manning), the details are here. Letting prisoners know that they aren’t forgotten is vital to any solidarity campaign and the best way to do that is to write directly to them. We prepared these sheets for the Liverpool Peace & Ecology Festival on 16 July, but they can be used anywhere. Download the pdf file of the info sheets below for printing. 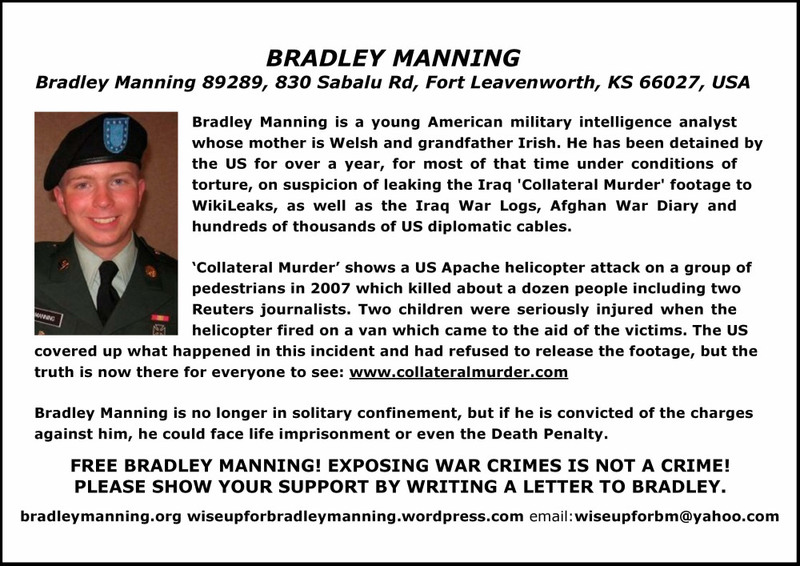 Bradley Manning 89289, 830 Sabalu Rd, Fort Leavenworth, KS 66027, USA. Courage to Resist, 484 Lake Park Avenue #41, Oakland, CA 94610, USA. Michael Lyons, a British navy medic, was sentenced to seven months detention at the beginning of July for ‘disobeying a lawful order’. He has also been demoted and dismissed from the Navy. Lyons had seen the WikiLeaks revelations about Iraq and Afghanistan, applied for conscientious objector status which was refused, and declined to take part in rifle training. His punishment is designed to send a deterrent message to anyone else in the Forces considering taking such action, so solidarity is crucial. 236 Lyons, D Company, MCTC, Berechurch Hall Rd, Colchester CO2 9MU. 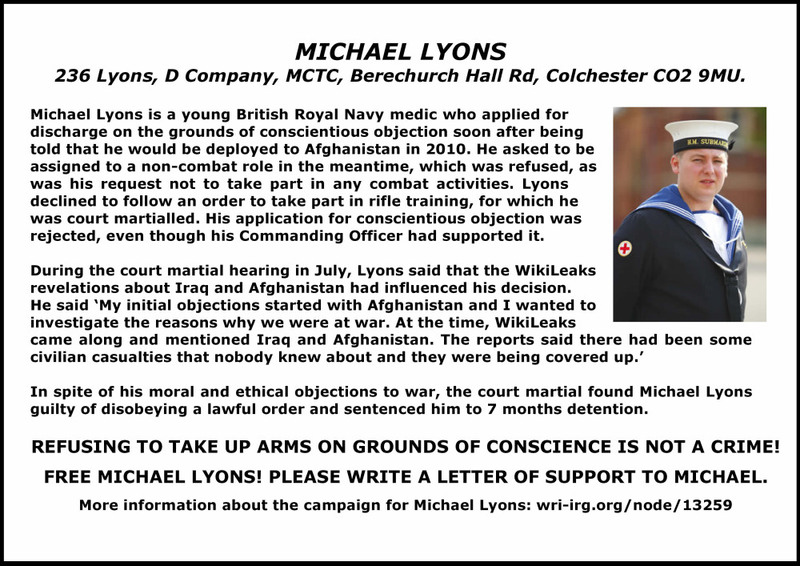 More information about the campaign for Michael Lyons can be found on the War Resisters’ International website. Download the pdf file of both the above info sheets. We also prepared this sheet with ideas for action, links to further information and contact details, and updated the Support Whistle-blowers flyer. Please feel free to download and share. This entry was posted in Lyons, Manning, Resources and tagged Bradley Manning, letters, Michael Lyons, solidarity. Bookmark the permalink. Wishing Bradley well and I hope to god he is released very soon, I will be there giving him a Hero’s welcome as he deserves. Amazing man, Amazing morals.